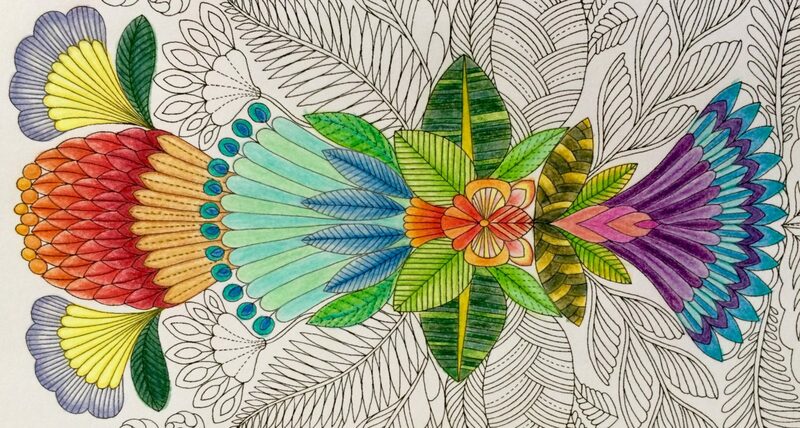 You may have seen or heard about the adult colouring craze but have you tried it? When I was a kid I loved colouring. I mean, I really loved colouring! 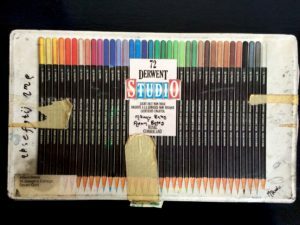 I have (yes I have, not had) a 72 set of Derwent Studio pencils. 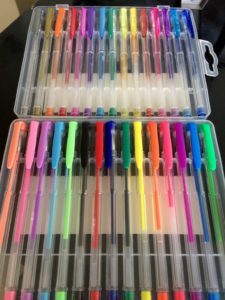 These were my pride and joy when I was younger and I may have expanded my set a little bit by adding some of the Artist, Watercolour and Graphic ranges over the years. But the thing is, as I got older I coloured less and less. 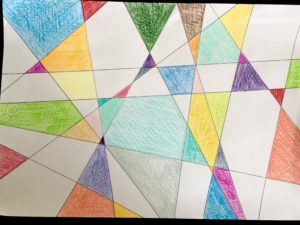 I got into drawing, painting and other creative pursuits but colouring was for kids, so I contented myself with the occasional fancy heading on a school project and doodles in my diary and colouring slipped away. That is until a friend put me onto adult colouring books – thanks Sally! These beautiful intricate designs are ready to colour in and easy to find and so I rediscovered the joy of colouring. Pretty simple huh! And it really doesn’t have to be any more complicated than that. Something to colour. There are many different options for this. You could grab one of the many adult colouring books available. This is the one I have – https://www.amazon.com/Millie-Marottas-Tropical-Wonderland-Colouring/dp/1849942854 – I think I got mine from Target but it’s available in many different stores, I just chose the Amazon link so you can see some of the amazing designs in it! You could find a free or downloadable design you like online and print it out. Try searching for colouring on Etsy, Pinterest or Google, there are heaps of beautiful options out there. Or you could try making something yourself. Start simple by getting a piece of paper, a ruler and a black pen or marker. 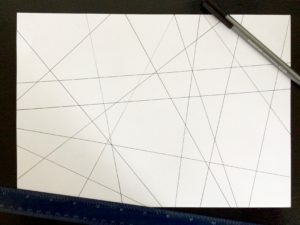 Then simply rule lines in all directions to create an abstract geometric page ready to colour in. 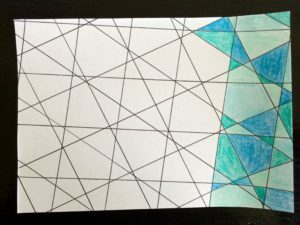 Check out the one I made – it only took me 2 minutes to make the lines, then I just coloured in the sections with random colours. Something to colour in with. Pencils, marker, pens, crayons, pastels… whatever you like, in as many or as few colours as you want. 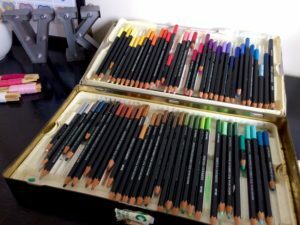 I’m a big fan of pencils and my favourite are Derwents – https://www.derwentart.com/au/au/home – but you can use anything you have on hand (even your kids pencils). Optional: an eraser – a good quality eraser is great if you’re using pencils but it’s notabsolutely necessary, especially if you’re simply colouring for fun! a sharpener – again if you are using pencils. Anywhere where you can take your colouring page and a few pencils, though a flat surface is helpful. A desk, dining table and kitchen bench are all great, as are outdoor picnic tables or the floor! It may take a long time to finish a complete piece, especially with some of the intricate designs in the adult colouring books, but you don’t have to finish the whole thing in one go. Only got 5 minutes before you have to head out? Grab a colour, do a little bit and then put it down and go. There’s no messy clean up with pencils, textas or crayons, so it’s a great creative hobby for people with small blocks of time that may be interrupted at any moment! You can make a range of images from simple patterns to highly detailed pictures. For me, colouring is more about the process than the end product, but the end product can be stunning and you may even want to hang it on the fridge! Below are some examples of different random shapes I drew then coloured in. 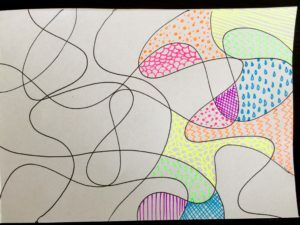 Top Left: I drew squiggly lines in black pen then coloured in the sections with fluro gel pens by making different random shapes and lines. 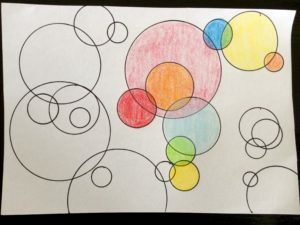 Top Right: I used my old mathomat from school to draw overlapping circles which I coloured in with pencils, each circle a different colour, seeing what happened when the colours mixed in the overlaps. Bottom Left: I drew freehand spirals (quite wobbly spirals but that doesn’t matter), then used glitter gel pens to colour along the edges of the black lines. Bottom Right: for this one I ruled lots of parallel lines the width of the ruler then coloured in the spaces with just 4 similar colours. With colouring you can jump right in. The aim is to add colour to your design – you can choose where and what colour, and even which parts to leave blank. 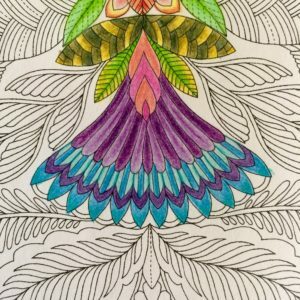 You can find resources to help you learn new techniques to expand your colouring experience though. A search for “adult colouring” on YouTube resulted in many interesting videos. 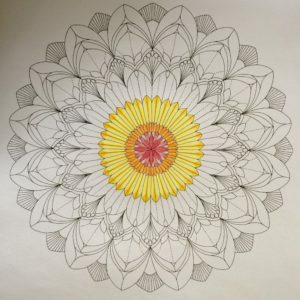 For example Johanna Basford, the creator of the Secret Garden colouring book, has a few great tutorials and even has her top 5 colouring tips – https://www.youtube.com/watch?v=z6rd7PDAMJY . 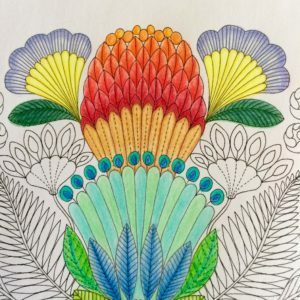 So have a click around the web if you’re after some new techniques to take your colouring to the next level. What are the positives, negatives and interesting things about colouring? Positives: So why is it popular? What are the positives? I think because it is accessible. You don’t need fancy equipment, a studio or tonnes of time. You can pick up a pencil and get creative. You don’t need to be able to draw an original design to make something you can be proud of. It’s fun and approachable, you can take it in any direction you like and just play. 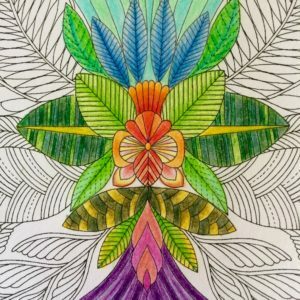 The new adult colouring books are both childlike and grownup, allowing you to relax by accessing your inner child and helping you disconnect from the outside world for a moment. And like all creative pastimes it is a way to express yourself, to be in the moment and explore, to create something that didn’t didn’t exist before that is a little piece of you. Negatives: Well it can be frustrating when it doesn’t turn out the way you want or you may feel restricted by the lines. 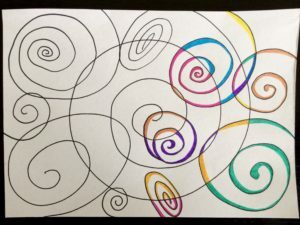 These frustrations are not uncommon in the creative arts but try to see them as a part of the learning process or a reason to branch out into a more freeform artistic pursuit. There is always a learning curve, even as an adult, and practice, experience and looking for help are a part of it. So just remember mistakes and frustration are awesome as they help us to grow, be yourself and have fun and turn the negative into a positive! Interesting: The concept of colouring seems to have been around for quite a long time and even the current trend of adult colouring has stuck around for a few years already. 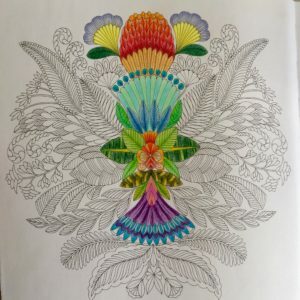 This interesting article talks a bit about both the history of colouring and how the current adult craze got started – http://www.maryevans.com/archiveBlog/?p=1402 . I used to love colouring, so doing it again as an adult has been kind of like coming home. It feels familiar and comforting to have a pencil in my hand, watching the colour appear on the page in front of me like magic. I find it almost meditative when I get in the zone as I don’t have to think about what to create, I simply go with the flow, play with the colours and see what happens. I find I get out my colouring book when I want to be creative but zone out a bit. So I put some music on, set my son up with his own activity so he’ll leave me be for a bit, pick a design that appeals to me and go for it. What do I feel are the benefits of colouring? It’s accessibility, as mentioned above, make this a great way to get a bit of creativity into your life. It’s relaxing when you choose to let go and just colour. It’s flexible enough to appeal to many different people and fit into all sorts of lifestyles. It’s an inexpensive creative pastime. So if you’re looking to get a little creative in your spare time, colouring is a great place to start. 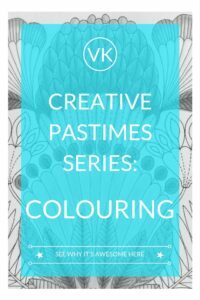 And if you’re not feeling the analogue-ness (I don’t think that’s a word) then you might like to check back for the next instalment of Creative Pastimes where I will be looking into the digital world of Drawing and Colouring Apps! And if you missed it, the previous Creative Pastimes was all about my passion – Crochet. Check it out here.